Check My School (CMS) is a project which combines technology information and community mobilization to improve the public education services. As an online platform for information access, CMS is designed to be both informative and interactive. It provides a profile page which contains the information about each school which contains pictures, school activities, services available, and many more. It provides different channels for sending feedback such as Facebook, Twitter, online chat box and even SMS for stakeholders with no internet connection. As a community mobilization project, it serves as a platform for citizens’ participation in monitoring enabling transparency and accountability in the school operations. It is the offline side of CMS, which is operationalizes the deployment of so-called information intermediaries or “infomediaries.” In the context of this initiative, “infomediaries” are capable and technology-literate volunteers drawn from the community, who, through the information they can source from available technologies, can engage their fellow community members about their public service-related inquiries or concerns. Such mechanism stimulates demand for access to information among people who are otherwise not serviced by the government because of their limited access to technology. The importance of access to information is best demonstrated through concrete cases where issues that directly affect the communities are resolved after utilizing information that had been made accessible. The initiative helps surface basic education issues and showcases community engagement with government to address them. This program of CMS is called Operation Thank You which translates information to issue resolution. The tagline “Promoting transparency and social accountability, one school at a time!” encapsulates the strategy to make education information relevant in a concrete way. It means facilitating response to a school issue through the collective efforts of government, community, civil society and private sector stakeholders. The regional operation is part of the project’s community mobilization component. CMS regional operations are consist of the area coordinator, infomediary and school volunteers. Each has several responsibilities which are considered as the core of CMS operations. Can be an organization or as an individual. Serve as the leader of infomediaries who are operating in an area (ex. Leyte area). S/he creates team of infomediaries in the area if there is none. 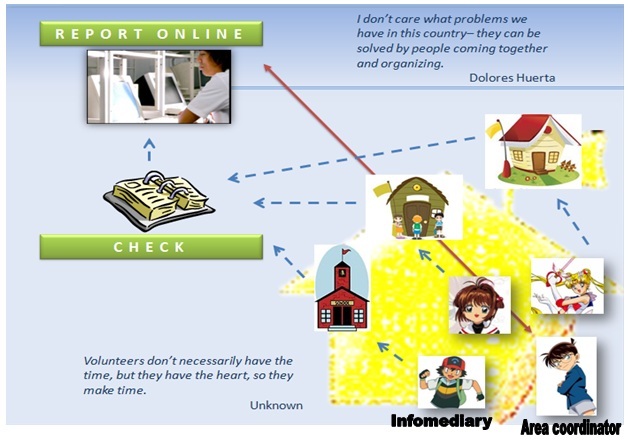 The infomediaries can be school stakeholders (parents, students, teachers), community stakeholders (NSTP students from other schools, youth organizations outside the schools), or a combination of both. Coordinates with the CMS national team regarding the area operations. S/he regularly communicates with the national infomediary coordinator. Coordinates with education stakeholders such as local DepEd offices, local school boards, and local citizen groups. Make sure that the digital platforms are active and updated. They create news articles, post picture, upload videos or provide content in the website. Make sure that the digital platforms are working properly. They popularize the use of the digital platforms, increase its users, and engage more people to interact. This unit serves as the support group of CMS in terms of generating funds and providing the necessary logistical and administrative needs of the project. They find ways to generate funds and resources for CMS through donations, sponsorship or fund-raising events. They serve manage properties of CMS including purchasing and keeping of supplies and other materials for operations. Takes charge in developing the team through team-building activities and the like. Helps in managing volunteers including profiling of volunteers, determining their needs, and responding to them. Facilitate linkages with groups interested in partnering with CMS.